OUR FORMULA FOR FAT LOSS? KEEP IT SIMPLE! Too often, metabolic circuits are little more than a mess of randomly paired movements. In this article we outline a formula for a great fat-loss workout that will test your limits while providing results! A good fat-loss sequence consists of five exercises performed back to back in a circuit. This circuit is developed to be a simple—but not easy—training formula to follow. There are two basic components to the fat-loss circuit: four strength exercises and one total-body cardio exercise. While you cycle through strength exercises, the sequencing of the fat-loss circuit creates a constant cardiorespiratory effect. Whenever you perform any strength exercise, your body pumps more blood to the muscles involved in the movement. By performing an upper-body exercise, followed by a lower-body exercise, followed by a core exercise, you constantly change where your body must increase blood flow. Click to get your FREE fat blasting workout! Just enter “FREE WORKOUT” in the comments section. The beauty of this fat-loss circuit is its simplicity and versatility. You can plug in virtually any exercise you want as long as it fits in the five categories. The purpose of these exercises is to focus on the abdominals and obliques while also incorporating the hips and shoulders, which, as mentioned earlier, has been shown to be a more effective way of training the abdominal muscles compared with trying to isolate them. This ingredient will fire up your fat-burning furnace like nothing else. When we combine high-intensity cardio and resistance training into one fast-paced workout you keep your heart rate elevated for the entire training session. You’ll burn more calories during the actual workouts, but more important, you’ll burn more calories after the workouts. A full fat-loss circuit (in this example) is 4 minutes of total work time with 1 minute of rest time, or 5 minutes total. Thus, 2 rounds last a total of 10 minutes and 3 rounds last a total of 15 minutes. There are five exercises and each circuit takes exactly 5 minutes. Typically, you will want to perform 2-3 rounds of a given fat-loss circuit with a total of 3-4 circuits in a given workout program. Each of the four strength exercises in a fat-loss circuit is performed for 30 seconds. You then rest 15 seconds before starting the next strength-based exercise. However, the total-body cardio interval, which is done last, is performed for 1-2 minutes. This means that as you become fitter, you may not need to take a complete rest for 60 seconds between circuits. Instead, you may want to do a longer active recovery by extending your cardio interval from 1 minute to 2 minutes, and then going directly into your next circuit. 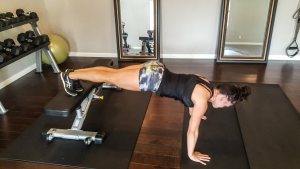 There are two intensities to consider for the fat-loss circuit: the total intensity of the entire circuit and the working intensity of each exercise within a given circuit. During the strength exercises within a circuit, you should be able to complete the entire 30 seconds of work time with good exercise form and at a fairly consistent tempo from what you started with. On a scale of 1 to 10 (with 10 being working very hard), at the end of each strength exercise you should be working at around a 7 or 8. Also, because the strength exercises are performed at a higher intensity than the total-body cardio exercise, they’re performed for a shorter amount of time—like 30 seconds. The goal is to complete as many reps as you can within the 30 seconds. However, never sacrifice movement quality for quantity. If fatigue begins to interfere with your exercise form, simply perform your reps more slowly or reduce the range of motion (e.g., don’t go as deep on squats or push-ups) in order to make the exercises easier and more manageable to maintain proper control. For the cardio interval, use a pace that gets you at or around 70-80 percent of your max heart rate. By the time you’re about to begin the next round of the circuit, you should feel mostly recovered. If you can get out a full sentence without breathing heavily (huffing and puffing), you’re good to go into your next round. But, if you’re still sucking wind after a 60-second break between circuits, you need to reduce the intensity of your cardio interval. Want an example workout you can implement and get started with today? Simply email me at jhunt@8one8fitness with the subject “FREE WORKOUT” and I will email you a workout you can start using immediately! ← LINE UP YOUR 2018 PLAN! One Response to OUR FORMULA FOR FAT LOSS? KEEP IT SIMPLE!